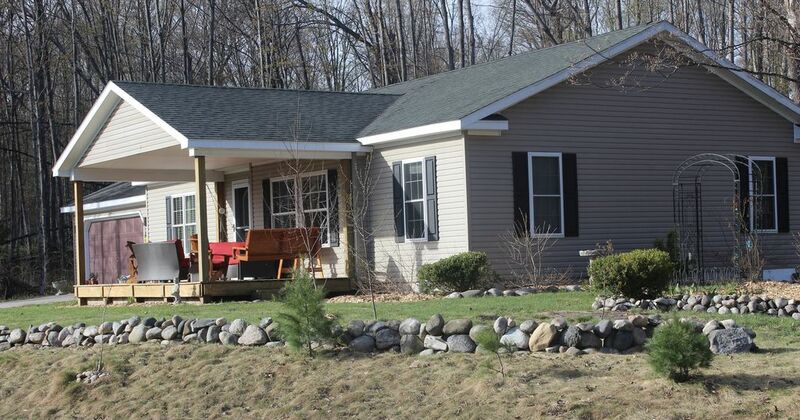 Enjoy the quiet in this peaceful location centrally located for easy access to all the joys of Leelanau County. Available are: two rooms, private bathroom, yet shared living space. The host remains on-site and occupies the other side of the house and shares living space. One room contains a double bed, tall dresser, bookshelf, desk and leather chair (2 guests @ $85/night). Beautiful views of wood and garden from windows of bedroom. A second bedroom is available for a 3rd guest of the party with a twin bed, closet, large wooden desk and leather chair (extra guest $20/night). A large private bathroom with shower/tub, single sink, toilet, hamper, blow dryer and towels next to these bedrooms for guests. A communal computer is available to access whenever guests need in the hallway between both of the guest bedrooms. Shared space involves kitchen, dining room, living room, outdoor porches and outdoor furniture, outdoor grills, fire pit, hammock, trails, paved driveway for parking. Bookshelves full of novels and poetry, numerous board games, sets of cards and high speed wireless Internet. We have a mid-sized Labradoodle, very friendly, well-trained and willing. For those with allergies, know she has Poodle hair. Coffee and tea is always available (including French press); large t.v. offers video streaming or all local channels, numerous board games, cards, and bookshelves loaded with highly recommended reading content are provided for indoor distractions. We are nestled into the back of a very quiet subdivision in a protected mature forest of maple and beech trees. From spring to early summer the forest floor is carpeted in wild leeks, violets and trillium. In the summer, perennial gardens bloom along the edge of the yard. The location of the house allows easy access to all the joys of Leelanau County and Traverse City: running the entire westside of us from north to south is the Sleeping Bear National Lakeshore (closest is 7 miles to Good Harbor Beach for hiking, beach walking, bird watching and swimming and 6 miles to the Heritage Trail bike route north entrance); the towns of Glen Arbor for kayaking, biking, eating, beach combing, swimming is 12 minutes and Empire with amazing vistas of Manitou Passage from the cliffs and the best sunsets is 20 minutes away. North along M-22 one can wander wineries, microbreweries and cider houses from Little Traverse Lake, to Leland, to Lake Leelanau, Northport, and Suttons Bay. More beaches, hiking trails and shopping and good eating. We are 20 minutes to Traverse City for anyone wishing to enjoy the Cherry Festival (end of June-July) and Film Festival (end of July-beginning of August). Directly south of us by 30 minutes is Interlochen Arts Academy for stunning summer concerts, Shakespeare plays and workshops and adult courses in music and creative writing. Overall, this is a very quiet home where you can find the peace to relax. The outside is large and ready for quiet reading, hammock napping, or evening campfires and storytelling. You can either have your quiet time and the ease of coming and going, or we can join together and go for a hike. I can either advise you through maps or take you to locations if you like; just let me know what you need. I used to be the traveler ... I am now a mom and a home owner. It is time for me to host the adventurer and build the camp fire for you to tell your stories. In turn, I can help you find local treasures as the many wonderful people in my past taught me how to live out the curiosity and build knowledge. My occupation is "teacher", specifically in English Composition and Literature. In the summers, I garden, cycle, hike with the dog, poke my son for healthy distractions, wander a beach if I feel like it, or read a great story where the breeze is soft. The location to nature and villages cannot be beat and the amount of open land on this side of the peninsula is surprising. It is simply gorgeous and peaceful. You will not believe how quiet it is. The trails are undulating. The air is constant but gentle. The trees are tall and the birds present. Maple City is a very modest rural farm land, but the entire county is intermittent with vineyards, hops trellis fields, cherry orchards, apple orchards, hardwood and evergreen forests. In the area: Glen Arbor, Empire, Frankfort, Leland, Northport, Suttons Bay, Lake Leelanau. Sleeping Bear National Lakeshore, Glen Arbor, Empire, Leland, Frankfort. For calls in the U.S. and emergency. We will provide and make beds. Many blankets available. You can bring your own pillow if you like. limited use, casual dry is typically needed. 3 day rotation on bath and hand towels; daily use of wash cloths. large. Seats 6-7 people at a time. Smoking outside (not on porch) and responsibly. Very comfortable accommodation with leisure activities and good eating within easy reach. Our stay with Kristine was awesome! She is a sweet-heart and will make sure your stay is comfortable. She has a beautiful home in a peaceful town. We felt right at home. A must stay just within 20 mins of so much!! Our stay with Kristine and her wonderful dog Mocha exceeded our expectations!! We felt right at home and enjoyed the wooded backyard. The beds were very comfortable too. Just a street over is a blueberry farm where my daughter and I picked our own blueberries! Kristine was wonderful with giving us tips to areas such as Glen Arbor, Sleeping Bear Dunes and Traverse City which are all about a 20 minute drive. Leland and Sutton’s Bay was not too far away either. A charming house located on a very quiet street close to the dunes, the beaches and Traverse City. What a pleasure it was to have you here! So much to do and so little time. The coffee is still strong and the weather is cooler.